To upload files in Amazon S3 (or Amazon Simple Storage Service) RadCloudUpload depends on the AWS SDK for .NET. This package can be installed from the NuGet Repository via the Package Management Console with the Install-Package command. The package management tool will add the necessary AWSSDK.dll assembly/assemblies to the solution. When a Web Application type of project is used, the Copy Local property in the Reference Properties dialog box, available from the References pane of the Project Designer, must be set to True . 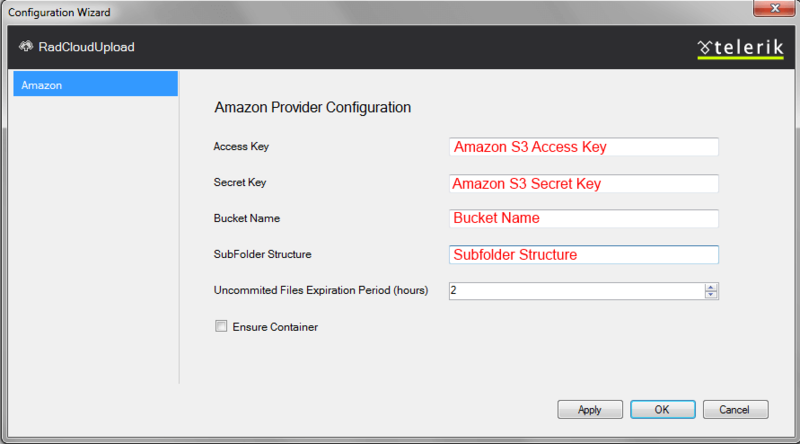 RadCloudUpload supports file uploading in Amazon S3. Configuration requires to set Access Key, Secret Key and Bucket Name. Uploading files in Amazon S3 is performed in chunks. Default chunk size defined by Amazon is 5 MB. Because the default ASP.NET size request is 4MB, you must increase it, in order to avoid errors. This can be done by increasing the value of MaxRequestLength property. Chunks which are not uploaded will be removed automatically by RadCloudUpload .